There are many “how - to” guides out there for many different projects, but when it comes to “how to build your own shed ramp” we have the answers all right here. For the perfect at home project with an easy to follow a guide, finishing your ramp shed will be easier than you think! We’ll show you the best tools to use and the steps to follow to get you to your finished shed ramp. This is an important section. This is all the tools you will need for our shed ramp plans. The ramp takes no time at all to build, but first, you must make sure you have the right tools. Keep in mind the length of the ramp, the width of the ramp, the material it’s made from, and what it is used for. Shed ramps are used for different purposes, but all are important. You can see those images for Shed Ramp Idea. The first tool you will need is a band saw to, or any saw you are comfortable with, that is set for wood or metal. You may have to cut the wood to a certain size due to what is available at your hardware store. Depending on the type of material you want to use, you will need to determine the width of your shed ramp, so you know what length to buy. Most ramps are 3-6” past the door opening. Make sure to purchase a length that is the exact length you want for your width or material you can cut down to size. Wood - Any pressure treated wood in the length you need. Make sure to verify the length you need before buying. Otherwise, your wood may be too short. You need the wood to be pressure treated because this wood is treated specially to resist rotting and the elements. Metal - You can use galvanized chicken wire or an expanded metal sheet cut to the width and length of your desired ramp. Optional: Concrete Blocks - If you wanted to have added support, then you will need anywhere from 7-10 concrete blocks, depending on the length of your ramp. You may need more. If using concrete blocks, you will also need powder actuated nailer to place nails into the concrete to hold the wood in place. Nuts and Bolts - You will need lag screws, 5-10, depending on the width of your desired shed ramp. You will need the same number of washers as you have lag screws. You will also need galvanized screws for this project. We know this is the part you’ve been waiting for. 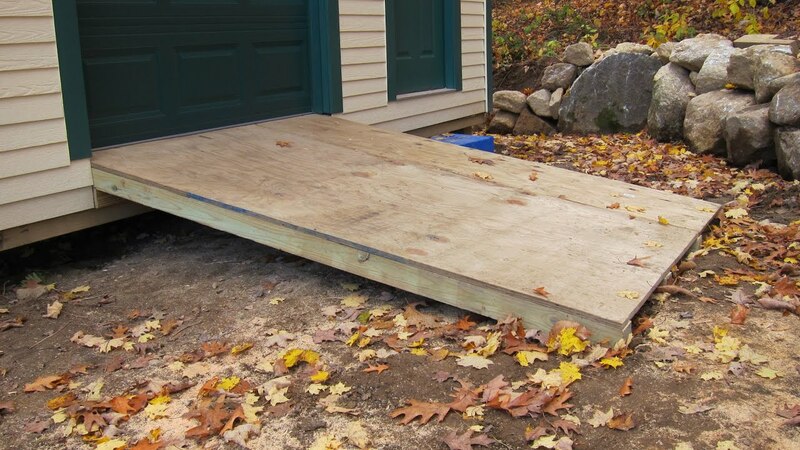 Here are the steps to building your own shed ramp. Make sure to wear your safety gear when working with your saws and any power tools. Gloves will keep your hands safe, goggles will keep your eyes safe, and a mask will prevent any dust or debris from entering your lungs. You need to attach a ledger board, you don’t have to, but this gives added support and helps your ramp last longer over multiple uses and time. To do this, attach a board that is 2 inches in width and the correct length of your ramp, to the base of the shed, below the entrance. Attach this ledger board with the lag screws and washers to securely hold in place and to help with the weight added to the ramp. Mark your area where the shed ramp will end and dig a place for the concrete blocks to sit in. Depending on your slope, make sure the blocks will be the base for your wooden ramp and give added support. Make sure these are level and straight. For this task, you will need to lay the ramp boards across the ledger and on the concrete blocks (if using). Using a smaller piece of wood, lay it beside the ramp angled wood and mark the ramp wood to be cut. This will give you more of a slope when you cut the angle. Do this to all the board for the desired width of your shed ramp. When finished, lay the boards about 5-6” apart. Nail into place on the ledger board. Place blocks of wood between each stringer wood (ramp wood) and this will keep the stringers equally placed. Using the powder actuated nailer, anchor the spacer boards into place to prevent any movement and to give a firm base to your ramp. This will allow for any vehicles, riding lawnmowers, bikes, and wheelchairs to be able to go up the ramp securely without movement or shifting. Cut the boards or metal to fit across the ramp boards in the correct length. You can choose to lay your boards vertical or horizontal, depending on how you like the look. Make sure to move around the wood to get the exact look you want for your shed ramp. Finally, nail or staple your wood or metal into place. Securely use the nails or staples to make sure the top of your ramp is connected to the stringers and stay in place. Each wood will have anywhere from 12-24 nails, depending on the length and width of your ramp. This isn’t necessary but very helpful in finishing your shed ramp. If using the chicken wire or metal sheet over the boards, you are finished. However, for those using wood, you have more options. You can pour concrete over the boards and create a herringbone design. This will allow for a non-slip surface for tires and allow water to drain. You can also use anti-slip paint that opts for a gritty texture to provide anti-slipping. You can also make a version yourself with exterior paint and coarse sand. This project is time-consuming but easily do-able in the afternoon. Building a ramp shed can be fun and easy, not hard. It can be a great bonding experience with your kids as well as helping them learn how to make things. Either way, you build your ramp shed, it’s important that it’s functional for your family’s needs. If you need wheelchair accessibility or place bikes or motorcycle sin the shed, then ramps help you from injuring yourself by lifting these heavy objects. Putting tools away and riding lawn mowers away will be much safer. Ramps are made to allow for ease of mobility and access, and your ramp will provide you with ease of putting tools away, easy storage for bikes and mowers, as well as helping with any trouble walking up steps or lifting heavy objects over a large dip.